Nine red lines on a stone flake found in a South African cave may be the earliest known drawing made by Homo sapiens, archaeologists reported on Wednesday. The artifact, which scientists think is about 73,000 years old, predates the oldest previously known modern human abstract drawings from Europe by about 30,000 years. “We knew a lot of things Homo sapiens could do, but we didn’t know they could do drawings back then,” said Christopher Henshilwood, an archaeologist from the University of Bergen in Norway and lead author of the study. The finding, which was published in Nature, may provide insight into the origins of humanity’s use of symbols, which laid the foundation for language, mathematics and civilization. The ancient drawing was unearthed in Blombos Cave, which is about 200 miles east of Cape Town. Archaeological deposits at the site date from 70,000 to 100,000 years ago during the Middle Stone Age. Inside the cave, scientists have uncovered Homo sapiens’ teeth, spear points, bone tools, engravings and beads made from seashells. Luca Pollarolo, a research fellow at the University of the Witwatersrand in Johannesburg, South Africa, was cleaning some artifacts excavated from the site in 2011 when he stumbled across a small flake, measuring only about the size of two thumbnails, that appeared to have been drawn on. The markings consisted of six straight, almost parallel lines that were crossed diagonally by three slightly curved lines. “We knew a lot of things Homo sapiens could do, but we didn’t know they could do drawings back then,” said Christopher Henshilwood, an archaeologist from the University of Bergen in Norway. He contacted Dr. Henshilwood and Karen van Niekerk, also an archaeologist from the University of Bergen, and they agreed that the flake was worthy of further investigation. They took the artifact to France to be examined by Francesco d’Errico, an archaeologist at the University of Bordeaux. There, the team had to determine whether the red lines were drawn onto the stone, and if they weren’t, what were they made of. Using a microscope, a laser and a scanning electron microscope, they determined that the marks were on top of the rock and that they were made from red ocher, a type of natural pigment that was often used to make prehistoric cave paintings. In fact, ancient humans in the Blombos Cave were making ocher paint as far back as 100,000 years ago. They recreated ocher paint, then fashioned a wooden stick into a brush and made strokes on stone flakes comparable to the specimen. They also made an ocher crayon and drew lines. They then compared the paint markings and crayon markings with what they had seen on the artifact. They determined that the ancient crisscross pattern was a drawing, not a painting, made with an ocher crayon tip that most likely measured only about 1 to 3 millimeters in thickness. That distinction between a painting and drawing is important, according to Dr. Henshilwood, because ocher paint batches can dry. That makes it less useful than an ocher crayon used by an ancient human whenever she or he wanted to make symbols without going to the trouble of mixing up paint. Dr. Henshilwood and his team also showed that the red lines were drawn onto a smooth surface. That indicated that the flake was once a part of a larger stone that the prehistoric humans may have used to grind ocher. They also showed that the original red lines most likely stretched past what was seen on the stone flake before the grindstone was broken. They cannot say with certainty what the purpose of the drawing was and whether it was mere doodling or if it held some greater meaning. But they have their conjectures. They also believe the drawing was made by a member of our species, and not some other hominin, because they have only found Homo sapiens remains in the cave. The earliest examples of abstract and figurative drawing techniques before this find came from the Chauvet cave in France, the El Castillo cave in Spain, the Apollo 11 cave in southern Namibia and the Maros cave sites in Indonesia, some of which date back to about 42,000 years ago. A recent study has also found Neanderthal paintings made of ocher in Europe that were 64,000 years old. “Up to now, we didn’t know that drawing was part of these ancient Homo sapiens’ repertoire,” Dr. van Niekerk said. Dr. Henshilwood said that similar criss-cross and hash mark patterns have been found engraved in pieces of ocher found in the cave. The latest finding, he said, provided further evidence that early humans in Africa used symbols and abstract thinking across a multitude of methods, including drawing, painting, engraving and jewelry making. Last edited by jserraglio on Fri Sep 14, 2018 3:06 am, edited 1 time in total. Nicholas St. Fleur wrote: They cannot say with certainty what the purpose of the drawing was and whether it was mere doodling or if it held some greater meaning. That's the point. Even if the artefact was made on purpose, unless we have a good idea what that purpose was, it's a stretch to call it an "abstract drawing." Modern-day humans draw four vertical lines and a diagonal line across to signify the number 5. Two vertical lines crossed by two horizontal lines are the number sign, or the pound sign, or the hashtag sign. Of course numbers are abstract too. And so is the "art" created by elephants and chimpanzees grasping a paint brush and sloshing paint on a canvas. The debate certainly does remain unsettled. Last edited by John F on Thu Sep 13, 2018 8:43 am, edited 1 time in total. All I can say is that here we run into the difference between anatomically modern humans and human behavioral modernity. There is no figuring some things out, nor is there likely ever to be. Nor is there likely ever to be any lack of interest in figuring out manifestations of symbolic thinking in ancient homo sapiens and how they relate to human behavior today. All I can say is that I am delighted that such investigations by curious scientists are taking place. Last edited by jserraglio on Thu Sep 13, 2018 9:19 am, edited 1 time in total. so is the "art" created by elephants and chimpanzees grasping a paint brush and sloshing paint on a canvas. Animal 'paintings' are not what these guys are investigating. They are focused on what appears to be a fragment of a larger symbolic drawing on a demonstrably human artifact. And these are drawings, not paintings -- a significant difference according to the article. Human paintings way older than these drawings have been found, but no drawings per se are known to be older. True, scientists may not yet know the purpose of these drawings, but that does not preclude what appears to be their purposefulness. Last edited by jserraglio on Thu Sep 13, 2018 11:17 am, edited 1 time in total. jserraglio wrote: Animal 'art' is not what these guys are investigating but rather a symbolic drawing on a demonstrably human artifact. Human beings are animals; all art is animal art. Anyway, my point is that to call anything "abstract drawing" or "abstract art" when one doesn't know what made it or why, may be leaping to a wishful and rather romantic but false conclusion. The conclusion may be correct, but in this and the National Geographic article I don't find a persuasive argument for it.
. . . so is the "art" created by elephants and chimpanzees grasping a paint brush and sloshing paint on a canvas . . . .
[The archaeologists] also believe the drawing was made by a member of our species, and not some other hominin, because they have only found Homo sapiens remains in the cave. If drawn by human hands on a human artifact (in this case a fragment of a stone flake that's likely part of an even larger object), the object will likely have a purpose. That is what the discoverers are proposing at this point, and of course, like most new discoveries, not every scientist agrees with their conjectures. There is, as you state, room for dispute, as the article itself makes crystal clear. Even if this turns out to be only a non-random "doodle" from 730 centuries ago, it would have great significance. Another aspect of interest, given recent discoveries there about archaic homo sapiens) is the south African origin of the drawing. Paul Pettitt, archaeologist, Durham University, UK wrote: The authors are right that this represents as yet the earliest known deliberate visual marking by Homo sapiens. The new discovery is critical to our understanding of the emergence of visual culture as it documents the transferral of one of these visual motifs to stone, in an intentional act. Last edited by jserraglio on Thu Sep 13, 2018 11:37 am, edited 1 time in total. The earliest known drawing in history sends a message through 73,000 years. Cross-hatched crayon on a rock shard suggests early humans indulged in abstract art. Blombos cave drawing with ochre pencil on silcrete stone. If a picture tells a thousand words, a cross-hatched design drawn on a fragment of rock some 73,000 years ago could speak volumes. The problem will be understanding what it tells us. The design, reported in Nature this week (C. S. Henshilwood et al. Nature https://doi.org/10.1038/s41586-018-0514-3; 2018), occurs on a lentil-shaped rock flake, and was found in Blombos Cave, on the southern shore of South Africa, by archaeologist Christopher Henshilwood and his colleagues. The flake bears an abstract design drawn, the authors say, using a crayon made of red ochre. It is hard to claim that the design is beautiful, dazzling or engrossing. But the artwork is destined to be priceless and famous, because it seems to be the earliest evidence for a drawing in the archaeological record, by some margin. Apart from some cave paintings from Spain dated to around 64,000 years ago — presumably the work of Neanderthals (D. L. Hoffmann et al. Science 359, 912–915; 2018) — the next instance of drawing came around 40,000 years ago with cave paintings found at opposite ends of Eurasia: in the spectacular art decorating the walls of caves in Spain and France, and the more recently discovered cave art in Sulawesi in Indonesia (M. Aubert et al. Nature 514, 223–227; 2014). Despite being located 12,000 kilometres apart, cave paintings such as these contain images that we instantly recognize as figurative art, including a range of animals, and stencils of hands that speak to us, millennia later, as signs of human self-awareness. A key distinction of this latest piece is that it is a drawing — a design made by applying pigment — rather than an engraving, made by scratching or cutting a design into a surface. Engraving has a longer prehistory than art. The earliest engravings known are on pieces of shell from Trinil, Java, dated to around 540,000 years ago, well before modern humans evolved, and presumably made by Homo erectus. Other ancient engravings have been found around the world; all are extremely simple: just lines, sometimes cross-hatched. There is nothing remotely similar to what we would recognize as imagery, and there is insufficient evidence to say whether they might represent something utilitarian, such as tally sticks or calendars. So, were these Palaeolithic hashtags actually designs intended to convey meaning, or mindless graffiti? Some might have been the unintentional result of another action, such as cutting food items, just like the scratches left on a chopping board after slicing a loaf. A drawing, by contrast, is much harder to dismiss. To be sure, the one from Blombos is as cross-hatched as the engravings, but it could not have been created as the accidental by-product of another process. Although proving intentionality is extremely hard, the authors examine the evidence they have — including detailed study of the ochre residues — with forensic thoroughness. It seems clear that the drawing was a fragment of something bigger, because some of the lines look as if they continued on to pieces now long gone. In addition, the authors attempted to restage history, using pieces of ochre themselves to show that such drawings can be made using crayons carved out of ochre (rather than, say, by brushwork), and that creating the design on such a rock fragment is possible only by deliberate rotation of the design through an angle, much as later artists might rotate their canvas. That the ancient artist chose to sketch with red ochre is less of a surprise. The mineral, largely consisting of iron oxide, has been used as a pigment since time immemorial. 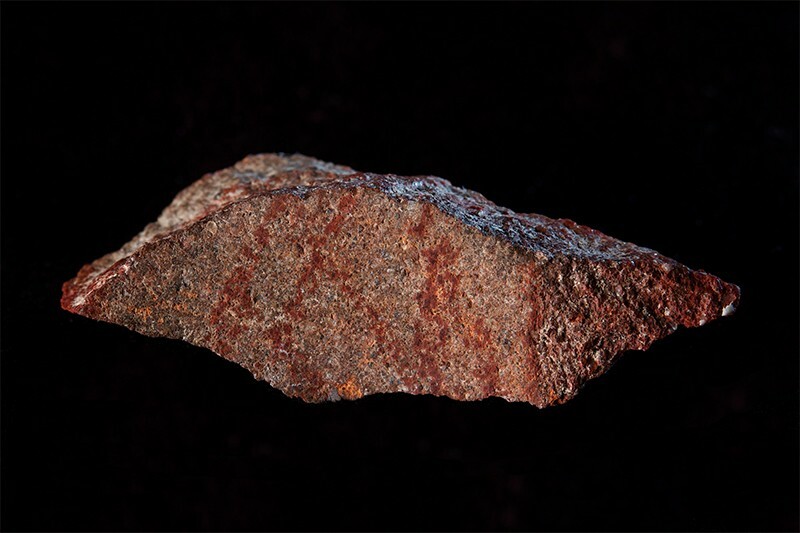 Its earthy red hues clearly meant a lot to the early modern human inhabitants of Blombos Cave and other nearby sites. They used it as an ingredient in paint, and perhaps even as a sunscreen. Between around 100,000 and 73,000 years ago, the people of the region produced artefacts tens of thousands of years in advance of humans anywhere else in the world, including finely worked stone and bone tools and engraved ochre pieces. That the early Homo sapiens living there were able to produce such designs suggests they possessed relatively ‘modern’ cognition and behaviour. What we cannot know is why they made the marks, or what they represent; unlike images of animals or hands, the drawing’s abstract nature offers no clues. And that raises a fascinating question about the history of art. Whereas the humans living in South Africa 100,000 years ago were using technology as yet undreamed of elsewhere, they had yet to invent figurative art. So, are the cave paintings of Lascaux and Sulawesi unconnected, independent inventions, or did modern humans create cave art somewhere else along the way, and then take it with them as they moved through the world? What is clear is that they started a trend, one that eventually led to Piet Mondrian, Jackson Pollock, Bridget Riley and the many great artists of today.